Dental anxiety provokes a sense of fear in people, typically before they arrive at Green Lake Dental Care. Those fears or worries are often exaggerated. Dental phobia shares many of the symptoms that characterize dental anxiety. It is a much more serious manifestation of that anxiety, and may provoke a sense of panic or terror in people. While people who suffer from dental phobias know that their feelings are irrational, they are unable to control, stop, or change those thoughts. Drs. Fraker and East and our staff have many techniques we can use to help patients feel more comfortable at their appointments. Dental Fear Central gives some simple suggestions to help children and adults who are apprehensive about going to the dentist, even if they suffer from the more severe form of anxiety: full-blown dental phobia. Drs. Fraker and East and our staff know that some patients are anxious about dental treatment, and we go to great lengths to make you feel more comfortable. Good oral health is very important, and when your mouth isn’t healthy, you can suffer from many other easily preventable medical problems. Earth Day teaches people that the planet belongs to everyone, so everyone is equally responsible for protecting it. Although Earth Day is an environmental celebration, our team at Green Lake Dental Care wants to remind you that you don't have to wait until then to make changes that will allow you and your family to live a greener life. 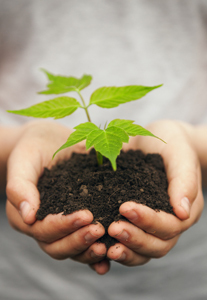 Happy Earth Day from the team at Green Lake Dental Care.